The PhAT System Raman analyzer is a variant of theRAMANRXN1™ analyzer specifically designed to address the limitations of even the best traditional Raman system for quantitative analyses of solid-state chemistries including pharmaceutical, catalysts, polymers, and specialty chemicals. 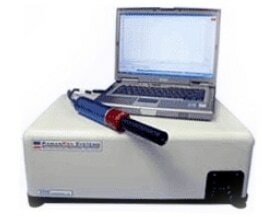 The application of PhAT technology has revolutionized solids sampling by eliminating sample irreproducibility and focusing, by measuring a representative volume of sample, and by offering the benefits of non-destructive sampling using laser powers below the ANSI exposure limit for skin. Raman data generated is high in information content and these peaks can often be interpreted in terms of individual chemical moieties, thus providing a fundamental insight into critical quality variable and attributes. The PhAT System is built upon the already established technology of the RAMANRXN SYSTEMS™ suite of Raman analyzers widely regarded as setting the standard for Raman analyzers for reliability, stability, applicability, and productivity. Sampling versatility to various unit operations and a variety of manufacturing equipment is accomplished using a fiber-optically coupled PhAT probe head. Both insertion and non-contact sampling options are available for the PhAT probe head to enhance sampling flexibility. A special probe interface is available for in situ tablet coating applications. The PhAT System Raman analyzer was designed for formulations development in the laboratory. For production in a manufacturing environment where cleanability is required for both the PhAT probe headand the analyzer, the RAMANRXN3™PhAT analyzer is available. The advent of PhAT technology has redefined the standard for simplicity and reliability for Raman spectroscopic analysis of solids samples. The use ofPhAT technology is opening up new areas to Raman analysis both in situ and at-line including solid-state chemistries applications and with the pharmaceutical, catalysts, polymers, and specialty chemicals industries.